Coin collectors consider Liberty Seated half dollars to be one of the classic coin series of United States coins. Availability of these coins ranges from quite common in well-circulated grades to exceedingly rare in any grade due to low mintage numbers. However, coin collectors value these coins for their historical significance and artistic design. 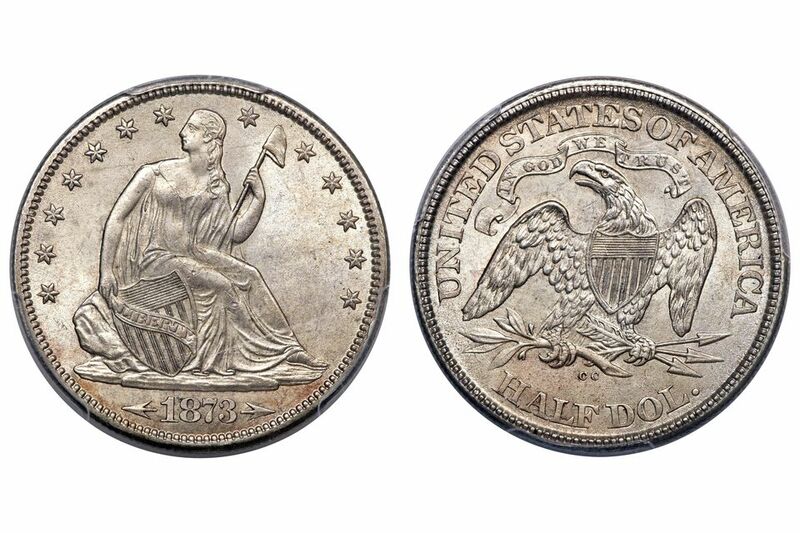 The United States Mint manufactured Liberty Seated half dollars from 1839 until 1891. Social and economic changes during this period precipitated seven different minor changes to the design and weight of the coin. In 1853, the United States Congress approved a reduction in the weight of the coin from 13.36 grams to 12.44 grams. The increasing cost of silver used in the minting process precipitated this change. In 1866, the motto "In God We Trust" was added to a banner above the eagle on the reverse of the coin. Designer Christian Gobrecht created both the obverse and the reverse design of the coin. The obverse consists of Lady Liberty sitting on a rock holding a shield in her right hand and a pole with a Phrygian cap in her left hand. The reverse consists of an American Bald Eagle holding arrows in one talon, and an olive branch in the other with a Union Shield emblazoned upon its breast. Liberty Seated half dollars are considered classic American coins. Most coin collectors only purchase one type coin at a reasonable cost. Advanced coin collectors are the only ones that consider assembling a complete set. Although demand for this coin series is fairly low, small mintages and low survival rates drive up values in almost all grades. The following Liberty Seated half dollars in any condition, are worth considerable more than common Liberty Seated half dollar. As such, these coins are frequently counterfeit or altered from common Liberty Seated half dollar. Therefore, before you start rejoicing in your new found fortune, have the coin authenticated by a reputable coin dealer or third party grading service. If your coin is worn and looks similar to the one illustrated in the photo link below, it is considered a circulated coin. The United States Mint produced Liberty Seated half dollars at four different mints: Philadelphia (no mint mark), Carson City (CC), New Orleans (O) and San Francisco (S). As illustrated in the picture link below, the mint mark is located on the reverse of the coin, near the bottom below the eagle and above "HALF DOLLAR." The buy price is what you can expect to pay to a dealer to purchase the coin. The sell value is what you can expect a dealer to pay you if you sell the coin. Look for the date and mint mark of your coin in the first column. These are approximate retail prices and wholesale values. The actual offer you receive from an individual coin dealer will vary depending on the actual grade of the coin and some other factors that determine its exact worth.